In outdoor games finish location needs to be marked. 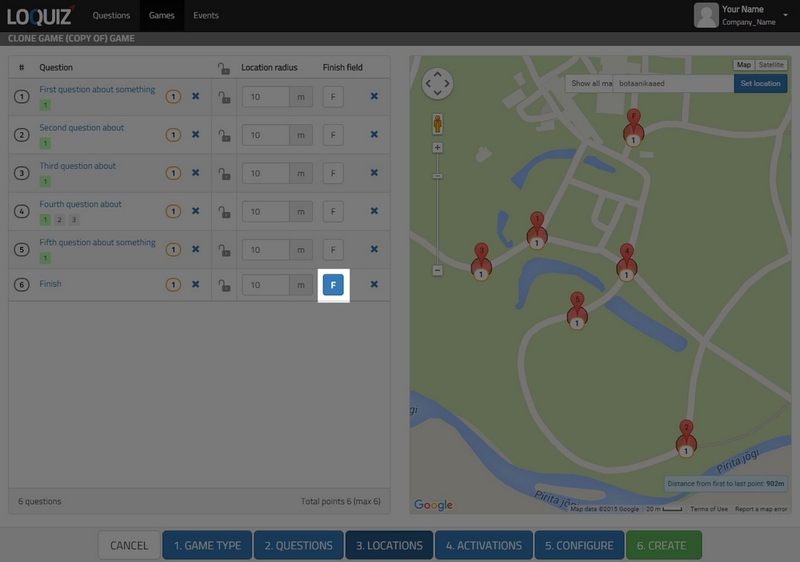 Games can have only one finish location and you can use any task as a finish location. Mark finish location while creating/editing game on “Locations” screen. There is a “F” behind every task, clicking the “F” marks the location as finish (it does not have to be the last one on the list). See the screenshot below. Note that finish location acts like any other pin in the sense that it can have the task attached to it. NB! If time runs out, finish task can not be answered. How the games is finished? Game finish behaves slightly differently depending on the game type. Game is finished if 1) all tasks are answered or 2) game time runs out. Finish text is shown after the game has finished. In this table you can find out, what happens with different finish criterias and when game timer stops. NB! There are actually two timers in the game – one “Game timer” is shown in mobile device on upper right corner (if set then countdown timer is shown on screen, if not set then counting starts from 0 and goes on). But there is also another timer named”Timer” which counts how much time did it take for the team to reach the finish field (real playing time). You can see this timer in device itself (Menu -> Score) and on Results page under “Time” column.